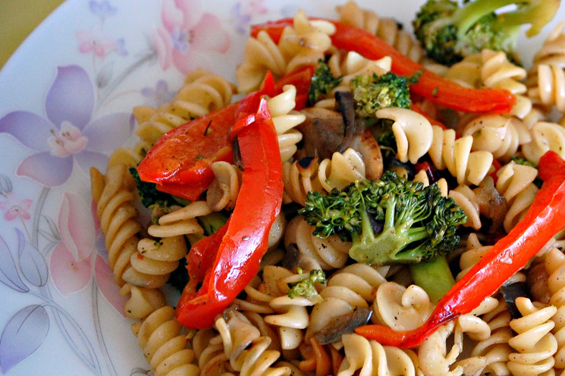 Great idea for a light meal… You must prepare and try this delicious pasta with vegetables ! 1. Cook the pasta al dente..
2. Meanwhile, wash and chop the pepper. 3. Cut broccoli into small flowers. Put broccoli flowers in hot salted water for 5 minutes and let them dry on a towel. 4. Wash champignons in a bowl with cold water. Take the mushrooms out of the water and let them dry. Cut champignons into small pieces. 5. Chop garlic into thin slices. 6. Heat pan on medium. Add olive oil and garlic. Fry garlic until soft. 7. Before garlic turns brown, add champignons. Fry the mushrooms until they turn golden brown and a little dry.